The Elders Scrolls III: Morrowind ranks in the top when it comes to most RPG player's all-time favorites. 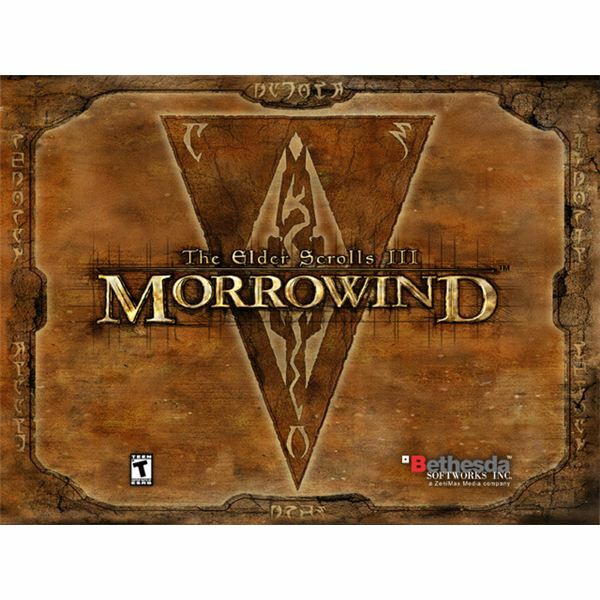 A successful move from the earlier 2D incarnations of the series to a modern, three dimensional model utilizing 1st or 3rd person player viewpoints, Morrowind places gamers in the position of a recently released convict sent to the island of Vvardenfell to join the Blades. This organization, effectively the secret service of the Imperial Empire, has only a small presence on Vvardenfell but is a vital component of the emperor's control over the province, which itself is key to holding Morrowind and its restive Dunmer residents. Morrowind's primary quest is extremely long and the plot surrounding it exceptionally complex – this is due at least in part to the size of the island of Vvardenfell, which takes hours in game-time to traverse from end to end. A volcanic land beset by monsters emanating from deep within the caldera of the central peak, it is filled with humanoid foes and hostile beasts galore. Players are offered an extremely wide variety of options when it comes to character construction and skills that, in classic Elders Scrolls fashion, level up depending on how often they are used. Unlike in some RPGs where simply killing enemies and completing quests provides experience points that allow a character to level up, in Morrowind the player has to constantly hone skills. Training can help, but is expensive. Morrowind's variety in quest types, factions, opponents, and outcomes sets it apart, and has led to its remaining the RPG of choice for gamers even after The Elders Scrolls IV: Oblivion succeeded it graphically and in canon. Indeed, Morrowind has retained a strong fan base comprised of diehards and modders who have continued to breathe new life into the title on the eve of the release of Skyrim, the next entry into the series. Any serious RPG gamer should give Morrowind a shot and look to some of the many mods available if the standard game experience becomes less satisfactory. Some general guides below will help novice players get going, and other detailed guides on the various races, factions, and character types that can be played help even advanced players get a new game going. In the end, Morrowind is so beloved perhaps more than anything due to its extreme level of character customization. If you can imagine a character, you can play that character. Character creation is a big part of Morrowind. A complex system of attributes, birthsigns, skills, preferences, and other statistics, the creation of a character sets the tone of the game and restricts a player's ability to effectively participate in certain aspects of the game until the level of related skills increases. For example, a warrior with low magic skills won't make it far in the Mages Guild or House Telvanni without some additional training. And a humble Breton with major investments in Restoration and Mysticism magic skills will not do particularly well in the Fighters Guild without extensive combat experience. There are ten races that live in Morrowind – indeed they are present throughout the empire. From the Imperials who run the show in the world of Tamriel to the wild Orcs found so commonly as armorers and warriors in dangerous lands, the races of Morrowind are sometimes divided into Humans, Elves, and Beastfolk. However this over-classifying ignores certain aspects of different racial groups that make them more similar to one another than to other members of the same race. For example, the warlike Dunmer Elves generally make for characters similar in skills and capabilities to Redguards or Orcs. Bretons are akin to Altmer in their spellcasting capabilities. And Orcs and Nords are flip sides of the same powerful, heavy infantry coin. Many older games need touchups to keep them current. Morrowind is no exception – after ten years its graphics are clearly dated. However the depth of the gameplay keeps many people interested, and there is no shortage of mods available. There is even the possibility that a fan or Bethesda supported MMO variant of vanilla Morrowind will be released in the future. Numerous fans have clamored for an interactive game that lets players create their own character and quest through the lands of Tamriel, and Morrowind's lasting popularity makes it possible that this will occur.